The use of dynamic address allocation in DHCP means a whole new way of thinking about addresses. A client no longer owns an address, but rather leases it. This means that when a client machine is set to use DHCP dynamic addressing, it can never assume that it has an address on a permanent basis. Each time it powers up, it must engage in communications with a DHCP server to begin or confirm the lease of an address. It also must perform other activities over time to manage this lease and possibly terminate it. The DHCP Lease "Life Cycle"
Calling dynamic address assignments leases is a good analogy, because a DHCP IP address lease is similar to a real world lease in a number of respects. For example, when you rent an apartment, you sign the lease. Then you use the apartment for a period of time. Typically, assuming you are happy with the place, you will renew the lease before it expires, so you can keep using it. If by the time you get near the end of the lease the owner of the apartment has not allowed you to renew it, you will probably lease a different apartment to ensure you have somewhere to live. And if you decide, say, to move out of the country, you may terminate the lease and not get another at all. Allocation: A client begins with no active lease, and hence, no DHCP-assigned address. It acquires a lease through a process of allocation. Reallocation: If a client already has an address from an existing lease, then when it reboots or starts up after being shut down, it will contact the DHCP server that granted it the lease to confirm the lease and acquire operating parameters. This is sometimes called reallocation; it is similar to the full allocation process but shorter. Normal Operation: Once a lease is active, the client functions normally, using its assigned IP address and other parameters during the main part of the lease. The client is said to be bound to the lease and the address. Renewal: After a certain portion of the lease time has expired, the client will attempt to contact the server that initially granted the lease, to renew the lease so it can keep using its IP address. Rebinding: If renewal with the original leasing server fails (because, for example, the server has been taken offline), then the client will try to rebind to any active DHCP server, trying to extend its current lease with any server that will allow it to do so. Release: The client may decide at any time that it no longer wishes to use the IP address it was assigned, and may terminate the lease, releasing the IP address. Like the apartment-renter moving out of the country, this may be done if a device is moving to a different network, for example. Of course, unlike DHCP servers, landlords usually don't let you cancel a lease at your leisure, but hey, no analogy is perfect. Figure 259 illustrates the DHCP life cycle using an example that spans three leases. 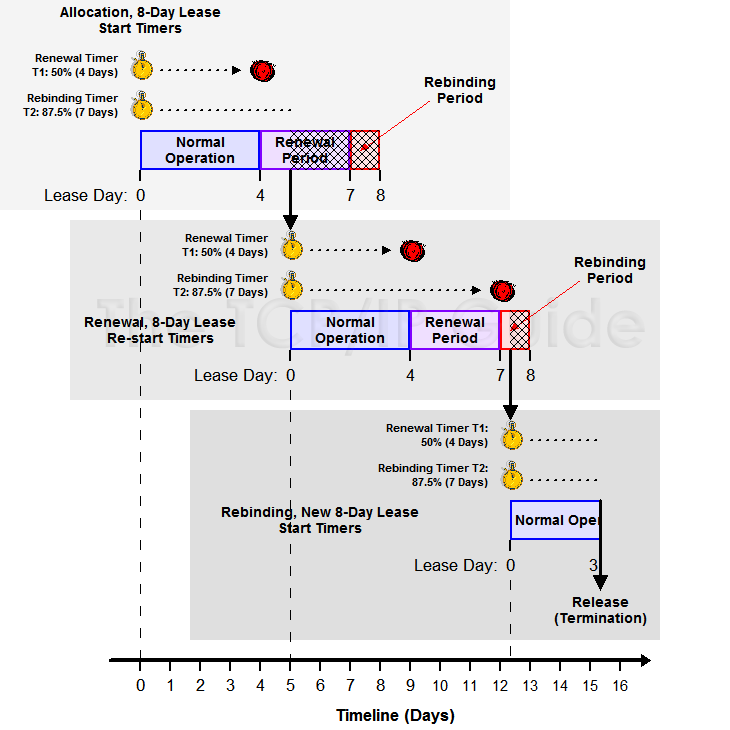 In this example, the initial lease has a duration of eight days and begins at Day 0. The T1 and T2 timers are set for 4 days and 7 days respectively. When the T1 timer expires the client enters the renewal period, and successfully renews at Day 5 with a new 8-day lease. When this second leases T1 timer expires, the client is unable to renew with the original server. It enters the rebinding period when its T2 timer goes off, and is granted a renewed 8-day lease with a different server. Three days into this lease it is moved to a different network and no longer needs its leased address, so it voluntarily releases it.